The evaluation of muscle performance may be accomplished by using a number of tests, including manual muscle testing (MMT), isokinetic dynamometry, and hand-held dynamometry (HHD). In the field of sports medicine, hand-held dynamometry (HHD) is gaining considerable interest over isokinetic testing, since the equipment is not expensive and easy to use on the field or training area of the athlete. A hand-held dynamometer (HHD) is a portable measurement device often used for assessing muscle function. Hip strength assessment plays an important role in clinical examination of the hip and groin region (Holmich et al., 2004), and clinical outcome measures quantifying hip muscle strength are needed. Standardized strength assessments of hip abduction (ABD), adduction (ADD), external rotation (ER), internal rotation (IR), flexion (FLEX) and extension (EXT) using a hand-held dynamometer are shown below (Throborg et al., 2010). The person being tested is in the supine position, with the hip in neutral position. The test-leg and the resistance point are placed over the end of the table. The opposite leg is flexed. The person being tested holds on to the sides of the table with both hands. The examiner applies resistance in a fixed position and the person being tested exerts a maximum effort against the dynamometer and the examiner. The resistance is applied 5 cm proximal to the proximal edge of the lateral malleol, against hip abduction. The standardised command by the examiner is “go ahead-push-push-push-push and relax” (lasting 5 s). The person being tested is in the supine position, with the hip in neutral position. The test-leg and the resistance point are placed over the end of the table. The opposite leg is flexed. The person being tested holds on to the sides of the table with both hands. The examiner applies resistance in a fixed position and the person being tested exerts a maximum effort against the dynamometer and the examiner. The resistance is applied 5 cm proximal to the proximal edge of the medial malleol, against hip adduction. The standardised command by the examiner is “go ahead-push-push-push-push and relax” (lasting 5 s). The person being tested is in the side-lying position, with the hip in neutral position. The opposite hip is in 90 degrees of hip flexion. The person being tested holds on to the side of the table with the upper hand and rest his head on the lower arm. The examiner stabilises the pelvis with one hand and applies resistance in a fixed position with the other. The person being tested exerts a maximum effort against the dynamometer. The resistance is applied 5 cm proximal to the proximal edge of the lateral malleol, against hip abduction. The standardised command by the examiner is “go ahead-push-push-push-push and relax” (lasting 5 s). The person being tested in the supine position, with the hip in 90 degrees of flexion. The person being tested holds on to the sides of the table with both hands. The examiner applies resistance in a fixed position and the person being tested exerts a maximum effort against the dynamometer and the examiner. The resistance is applied 5 cm proximal to the proximal edge of the patella, against hip flexion. The standardised command by the examiner is “go ahead-push-push-push-push and relax” (lasting 5 s). The person being tested is in the prone position, with the hip in the neutral position. The person being tested holds on to the sides of the table with both hands. The examiner applies resistance in a fixed position and the person being tested exerts a maximum effort against the dynamometer and the examiner. The resistance is applied 5 cm proximal to the proximal edge of the medial malleol, at the posterior aspect of the lower leg, against hip extension. The standardised command by the examiner is “go ahead-push-push-push-push and relax” (lasting 5 s). The person being tested is in the sitting position, with the hip in 90 degrees of flexion. The person being tested holds on to the sides of the table with both hands. The examiner applies resistance in a fixed position and the person being tested exerts a maximum effort against the dynamometer and the examiner. The resistance is applied 5 cm proximal to the proximal edge of the patella, against hip flexion. The standardised command by the examiner is “go ahead-push-push-push-push and relax” (lasting 5 s). The person being tested is in prone position, with the hip in neutral position and the knee in 70–90 degrees of flexion. The person being tested holds on to the sides of the table with both hands. The examiner applies resistance in a fixed position and the person being tested exerts a maximum effort against the dynamometer and the examiner. The resistance is applied 5 cm proximal to the knee joint line, at the posterior aspect of the thigh, against hip extension. The standardised command by the examiner is “go ahead-push-push-push-push and relax” (lasting 5 s). The person being tested is in the prone position, with the hip in neutral position and with 90 degrees of flexion in the knee. The person being tested holds on to the sides of the table with both hands. The examiner applies resistance in a fixed position and the person being tested exerts a maximum effort against the dynamometer and the examiner. The resistance is applied 5 cm proximal to the proximal edge of the lateral malleol, against hip internal rotation. The standardised command by the examiner is “go ahead-push-push-push-push and relax” (lasting 5 s). 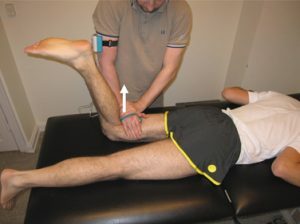 The person being tested is in the sitting position, with the hip in 90 degrees of flexion. The person being tested holds on to the sides of the table with both hands. The examiner applies resistance in a fixed position and the person being tested exerts a maximum effort against the dynamometer and the examiner. The resistance is applied 5 cm proximal to the proximal edge of the medial malleol, against hip external rotation. The standardised command by the examiner is “go ahead-push-push-push-push and relax” (lasting 5 s). The person being tested is in the sitting position, with the hip in 90 degrees of hip flexion. The person being tested holds on to the sides of the table with both hands. The examiner applies resistance in a fixed position and the person being tested exerts a maximum effort against the dynamometer and the examiner. The resistance is applied 5 cm proximal to the proximal edge of the lateral malleous, against hip internal rotation. The standardised command by the examiner is “go ahead-push-push-push-push and relax” (lasting 5 s). 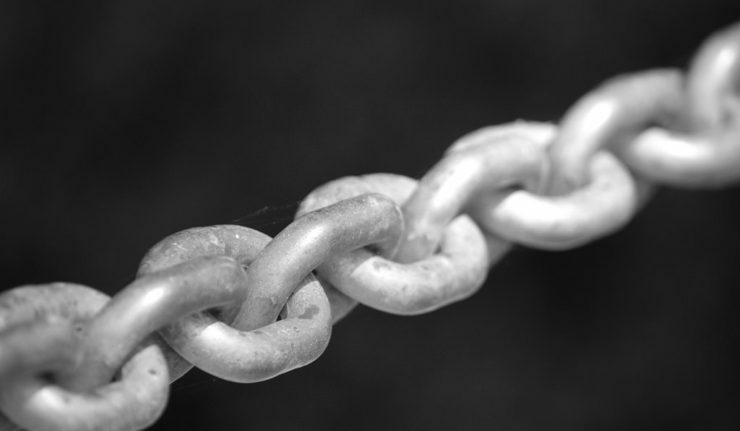 The reliability of HHD in measuring upper extremity strength has been favorable in the literature however, reliability may be compromised by testers who are unable to stabilize the device during testing. 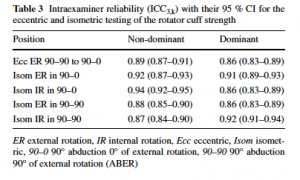 Cools et al (2016) describes the following test positions for shoulder HHD testing with excellent inter- and intra reliability, all positions ICC >90. The subject was in a seated position, feet at shoulder width, the lower back supported against a chair, and held the elbow and shoulder at a position of 90° of abduction and 90° of external rotation (90– 90) with support from the examiners hand and forearm. The HHD was positioned at a point 2 cm proximal of the processus styloideus ulnae and placed on the dorsal side of the forearm. These procedures were found to have good test–retest reliability, excellent intra- and interrater reliability (Cools et al 2016). Cools, A M J., Vanderstukken, F., Vereecken., Duprez1, M., Heyman, K., Goethals, N., & Johansson, J. 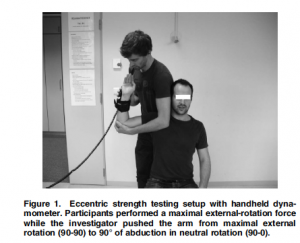 (2016) Eccentric and isometric shoulder rotator cuff strength testing using a hand‑held dynamometer: reference values for overhead athletes. Knee Surg Sports Traumatol Arthrosc 24:3838–3847. DOI 10.1007/s00167-015-3755-9.